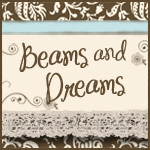 I'm very excited to welcome you to Beams and Dreams! Set in the beautiful Litchfield Hills,foothills to the New England Berkshires Mountains- my town is the perfect mixture of rural and urban! I'm Wendy, design blogger at Beams and Dreams. I love the quote "A house is made of Wood and Beams but a home is made of Hopes and Dreams". We purchased our home about a year and a half years ago, and after a bit I have finally have been able to start making the changes I wanted to change our house into our home. I think that there are a lot of little things can make a huge difference in making a house welcoming. All those chances DO NOT HAVE TO COST A LOT. I explore ways to make it beautiful on a budget. My husband Dave and I have loved to go to flea markets, garage sales, and thrift shops since we started dating. We've shared this love with our children. Dave and Aedan love to look for vinyl records, and Ally andI look for everything else! It's not unusual to see me pulled over on the side of the road to examine a box left on the curb with a "free" sign on it. Ones man's trash really is another man's treasure! There are so many ways to make a favorite design in a cost saving way. I am a full time Wife and Mom. Our kids are 9 and 12, and decorating a home with kids is a whole different ball game when the kids are older... they have OPINIONS! :) It's fun incorporating their ideas and ideas in our home. I try to always remember that it's THEIR home, too, and it is our HOME, not a designer showplace, so it has to live easy. I'm always changing things around. It's not unusual for Dave to come home and the rooms have been rearranged, or a new piece is being refinished in the garage. I"m after a comfy, cozy, loving, warm, place that we all love to be together! I hope you'll join me on this fun journey of turning my Beams into my Dreams!